Tranquil Realty: Why Cayman Brac? The beauty of Cayman Brac lies in its relaxed pace, welcoming and friendly inhabitants, and spectacular natural beauty. This little island gem lies 90 miles northeast of Grand Cayman and 5 miles east of Little Cayman. It is approximately 12 miles long by approximately 1 mile wide, comprising 14 square miles of natural beauty. It is home to roughly 1800 residents. 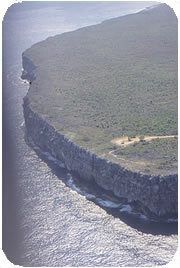 Cayman Brac derived its name from Cayman, the Carib word for crocodile and Brac from the Gaelic word for bluff. The island's main physical landmark is the 140 ft. high bluff which is fast becoming an attraction for rock climbing enthusiasts. Nestled amongst the bluff are a myriad of caves which provide shelter and home to local bats, great exploring territory. There is plenty to see and do on The Brac. Nature tourism abounds here with trails, caves, and wildlife. Scuba diving, deep sea fishing, kayaking are just a few of the ocean adventures available. The pace is slow, the people are friendly, and the island is virtually crime-free. Explore the possibilities of owning a piece of this island paradise.